Evangelist Verda Louise Blevens was born April 12, 1927, in Arkadelphia, Arkansas. She was the fourth of four children born to the late Samuel and Lula Tate. She confessed her hope in Christ at an early age under the leadership of the late William Anderson at St. Ruth Baptist Church in Gum Springs, Arkansas. On September 11, 1943, she was united in Holy Wedlock to John W. Blevens. At his demise on February 18, 2001, they had enjoyed 57 years of wedded bliss. Evangelist Blevens moved to Chicago, Illinois in 1946 and in the year of 1949, she united with Calvary Light Pentecostal Church under the leadership of district Elder William Wonders. She was baptized in Jesus' name and on April 23, 1949, she received the gift of the Holy Ghost and became a great missionary worker for the Lord. Many souls were saved through her life and dedication to the Lord. Evangelist Blevens was a great organizer and worker in Calvary Light Church. She was the president over the Junior Missionary Department, president over the Senior Missionary Department, and organizer and president over The Sisters of Faith Auxiliary. She organized the Annual Mother's Day Program and the Family and Friends Day Program. She was leader of the Monday Prayer Band, a Sunday school teacher, and assistant secretary of the Sunday School Department. She was the head cook in the kitchen; she organized the combined choirs, sang in the choir, and was part of the outreach and radio ministries. She also helped to beautify God's house through her hard labor. She was First Lady of the Church from 1971 to 1991 as she labored willingly and cheerfully beside District Elder Blevens while he was pastor of Calvary Light Church. 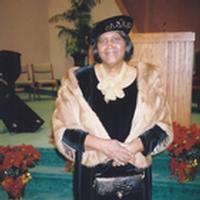 Evangelist Blevens was always a faithful member and always did what the Lord set before her. In the Illinois District Council she was treasurer for the Ministers and Deacons Wives Auxiliary; she also worked with the Missionary and the Sunday School Departments. She was on the Prayer Committee in the Pentecostal Assemblies of the World (P.A.W.) International. Evangelist Blevens and family moved back home to Arkansas in October 1991. She united with Apostolic Faith Church of the United Pentecostal Churches under the leadership of Pastor James Langley. She served faithfully until 2001. She solicited money to help purchase new pews for the church and helped purchase a new truck for her pastor. She was the head cook and testimony leader for the morning service. She also preached several times. In 2001 Evangelist Blevens decided to move her membership to the First Pentecostal Church where Elder Richard Price is the pastor and where her best friend, Sister George Ann Stalling, attended. Evangelist Blevens leaves to cherish her memories: her best friend, Sister George Ann Stallings; one brother, Edgar Tate; three nephews; four nieces; eleven God children all of Chicago, Illinois; four claimed children, Darryl Jackson, Keith Moore, Jackie Craig and Craig Harper; a "special son" Bob Meltzer, other special children; Blevens Brother-in laws, Joseph, Samuel, Wiley, Matthew and John Henry; a host of relatives and friends and the Saints of the Most High God. Visitation will be Friday, September 2, 2016 at Mitchell Funeral Home from 9 a.m.-5 p.m. The homegoing service of Evangelist Blevens will be at First United Pentecostal Church on Saturday, September 3, 2016 at 4 p.m.